The Tampa Bay Rays enter play with a chance to take the first series of the season, after winning back-to-back games against the Houston Astros. The Rays defense and bullpen have looked stellar thus far, playing error-free baseball and hurling 11 scoreless frames (respectively). What’s a ballgame without a little help from the defenders? Glasnow got just that as his battery mate, Michael Perez, caught Jose Altuve trying to steal second in the first inning, while Ji-Man Choi made a nice play to finish off a 6-4-3 double play in the third. To be able to shut down a runner like Altuve, that probably sends somewhat of a message to the Astros in that it’s not that easy to walk into second base. Even with Glasnow on the mound. Despite the outcome of Thursday’s home opener, Tampa Bay’s bullpen has been strong, which Rays manager Kevin Cash spoke about in his post-game presser last night. They’ve been outstanding. The way the matchups have gone, we’ve been pretty fortunate with where the lineup is and the turnover and all that. We’re not always going to have those ideal matchups, but so far when we’ve called on (the bullpen) they’ve really done a nice job. The Rays will go for the series win on Sunday with Yonny Chirinos (5-5, 3.51 ERA) on the mound, pitching opposite of Wade Miley (5-2. 2.57 ERA). Since Ryne Stanek threw two innings last night, Cash scrapped the plan to use an opener on Sunday against Houston and instead will go with Chirinos in a conventional start. The right-hander did not face Houston last season. In 2018, Chirinos went 3-2 at the Trop with a 3.66 ERA across 51.2 innings (10 games, three starts). He allowed six homers. You can read about the series in our preview, while Sunday’s starting lineup is below. At long last the cold — relatively speaking — offseason is over, and it’s time for baseball! 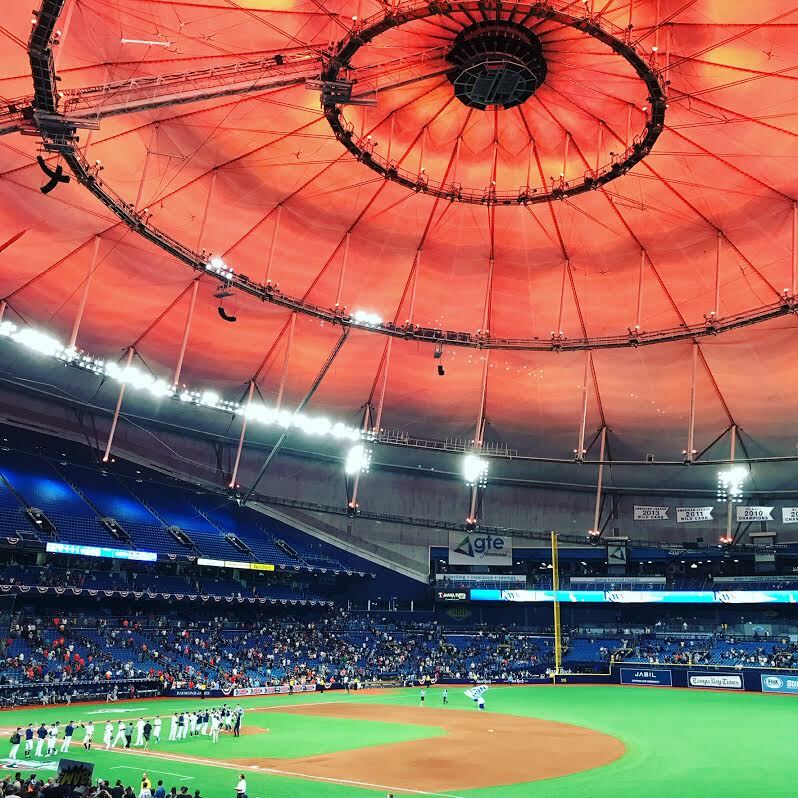 The Tampa Bay Rays welcome the Houston Astros into Tropicana Field on Thursday, for the first game of a four-game set. 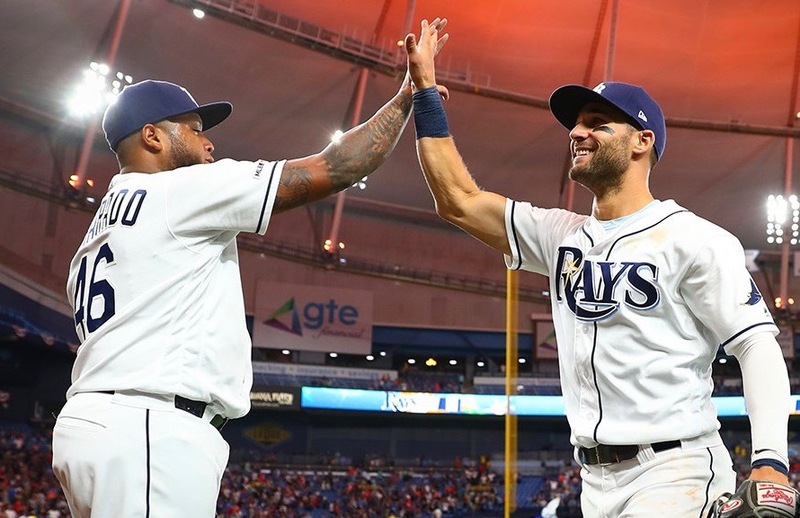 The Rays finished the 2018 season on an impressive run, completing their first 90-win campaign since 2013, which was also the last time they reached the postseason. Their relatively healthy Spring Training has Manager Kevin Cash, and the players, excited for the start of the 2019 season. We feel good as a group. We came out of the gate healthy here with the exception of Matt (Duffy). That’s a huge concern for most teams throughout Spring Training. I think we’ve got better. Houston won the division title a season ago, yet came up one step short of a return trip to the World Series. Be that as it may, the Astros are incredibly talented and won the 2017 World Series. They look to start the 2019 season on a high note en route to what they hope will be another division-winning season. Tampa Bay made some solid offseason additions, many of whom will impact the 2019 roster right off the bat. Right-hander Charlie Morton will slot in second in the rotation, Yandy Diaz will spend time both at first and third base, catcher Mike Zunino will be Tampa Bay’s primary backstop, while outfielders Avisail Garcia and Guillermo Heredia will give the team some pop. The Astros Retooled the lineup and the rotation, most notably adding left-fielder Michael Brantley, who signed a two-year deal in free agency. The outfielder hit .309 with 17 homers last season and will bolster a batting order that already has pop. And while Carlos Correa and Jose Altuve were out for portions of the season, Houston still generated nearly 800 runs. 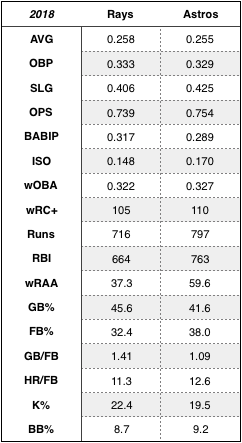 Yet the Rays weren’t slackers, comparing well to Houston last season in every offensive metric with the exceptions of runs, RBI, ISO, and wRAA. Correa, however, could be a scratch for Opening Day due to a stiff neck suffered last week while in a rundown. He did not play in the last two exhibition games. Aledmys Diaz would be the likely replacement if Correa is unable to go. We don’t think it’s a longterm serious issue, but I don’t love the fact that we’ve had to scratch him a couple of days and he’s heading into the season having not played for a few days. But it’s the cards we are dealt. If somebody else has to play, then we’ll still be good. Over the next four days Kevin Cash will lean on Blake Snell (21-5, 1.89 ERA), Charlie Morton (15-3, 3.13 ERA), Tyler Glasnow (1-5, 4.20 ERA), and likely Yonny Chirinos (5-5, 3.51 ERA), who would follow an opener. A.J. Hinch will follow with Justin Verlander (16-9, 2.52 ERA), Gerrit Cole (15-5, 2.88 ERA), Collin McHugh (6-2, 1.99 ERA), and Wade Miley (5-2. 2.57 ERA). Blake Snell‘s defense of the 2018 American League Cy Young Award begins in full on Thursday, when the southpaw will make the first Opening Day start of his career. Snell is coming off a 2018 season where he led the AL with 21 wins and a 1.89 ERA (2.95 FIP). First game of the season I’m always pumped. Nervous, but more just ready. It’s been a long time to think about it. I want to get it going, and then that’s when it really hits that the season is starting and we’re getting back into the stride of things. 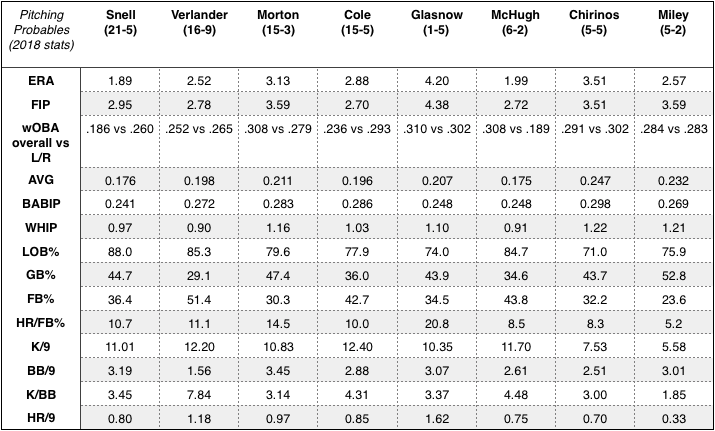 The matchup is noteworthy because only twice have the reigning Cy Young Award winner and the runner-up for the award faced one another on Opening Day. The Rays haven’t said who will be the bulk innings guy on Sunday, however, since the Astros are a right-handed heavy lineup, it would seem that Yonny Chirinos would slot in on Sunday. It all depends on how the first three games of the series pan out. We will update this as the details emerge. 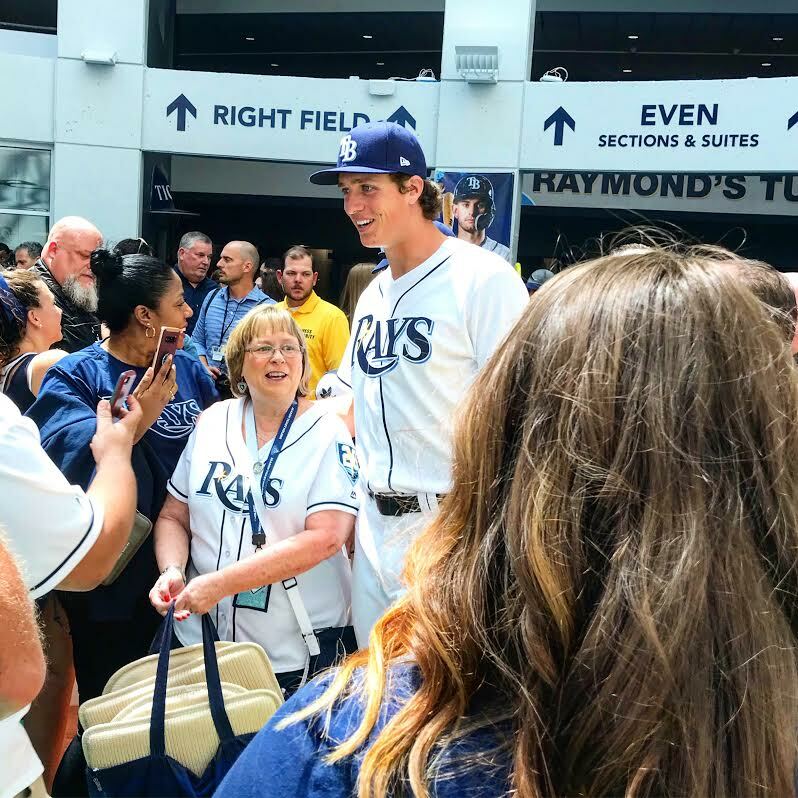 — The Rays announced that Opening Day is sold out; the 14th consecutive Opening Day sellout. Matt Duffy (hamstring) will start the season on the injury list (IL). In spite of Matt Duffy’s best effort to overcome a lingering hamstring injury that shelved him from the bulk of the Spring Training contests, it appears that he will open the season on the injured list. Duffy, who got nine at-bats across multiple Minor League games on Friday, was scratched from the lineup before Saturday’s game against the Tigers. Not ideal for Matt, but I appreciate him being honest last night and say that he just didn’t feel right. I think we did everything. The training staff did a great job, Matt did a great job trying to get back. Time just beat us up a little bit. Duffy will continue to test his hamstring over the next couple of days while the Rays will take it slow in order to get him back to health ahead of his return. I would imagine we would take our time with this and try to get it under wraps. We didn’t want to rush it, but our best team is with him on the roster. Duffy will likely be placed on the 10-day IL on Monday, meaning he could miss just the first seven games of the regular season. That would allow him to rejoin the team in San Francisco, where he used to play, for the April 5-7 series against the Giants. Yandy Diaz, Daniel Robertson, and Joey Wendle will see most of the reps at third base to start the season. The injury also opens up another spot on the roster for Tampa Bay. Outfielder Guillermo Heredia now could break camp with the team, which would give the Rays six outfielders and thirteen position players. They, however, could also add a thirteenth pitcher to the roster. Emilio Pagan, Hunter Wood, Jalen Beeks, and Adam Kolarek are still competing for a spot. Obviously, people are going to lean towards Guillermo Heredia. But we have some decisions to make, whether we carry an extra pitcher and then we still have to decide that last and final spot. … Last year, I believe it was the day of. I certainly hope we’re not that late, but sometimes they go down to the wire. I don’t think our plan is to be that late, for sure.